1. 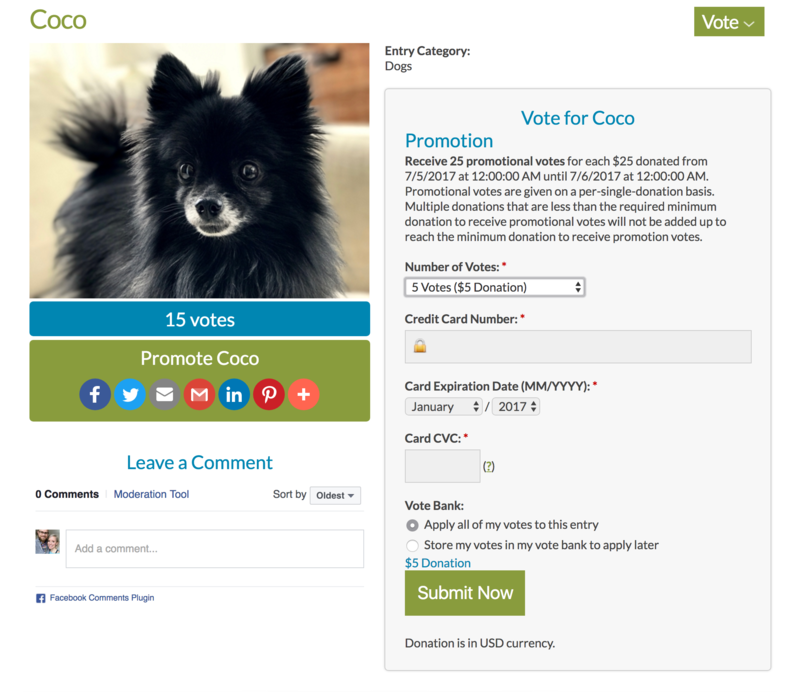 ANY CONTEST CAN RUN A VOTE PROMOTION. 2. 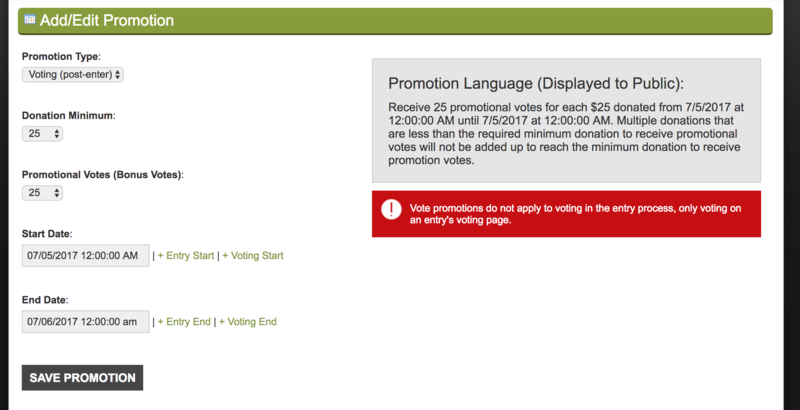 YOU CAN RUN MULTIPLE VOTE PROMOTIONS IN A CONTEST, FOR ANY LENGTH OF TIME. 3. 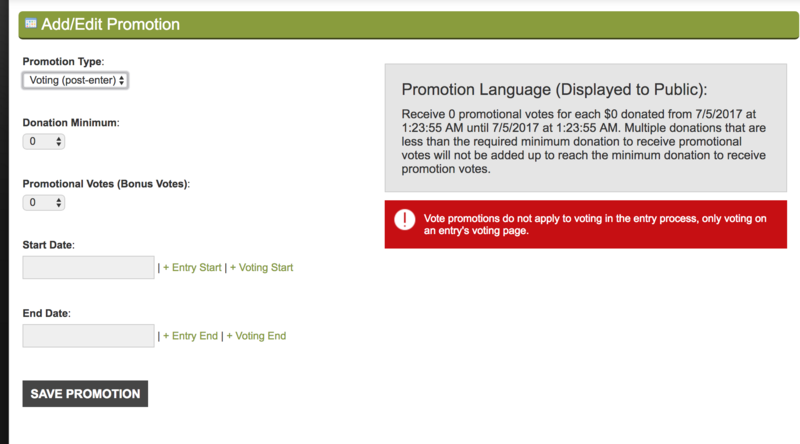 VOTE PROMOTIONS DO NOT APPLY TO VOTING IN THE ENTRY PROCESS, ONLY VOTING ON AN ENTRY'S VOTING PAGE. 4. MULTIPLE DONATIONS THAT ARE LESS THAN THE REQUIRED MINIMUM DONATION TO RECEIVE PROMOTIONAL VOTES WILL NOT BE ADDED UP TO REACH THE MINIMUM DONATION TO RECEIVE PROMOTION VOTES. 5. VOTES ENTERED OFFLINE, BY THE CONTEST ADMIN, DO NOT AUTOMATICALLY RECEIVE BONUS VOTES. YOU (THE CONTEST ADMIN) MUST CALCULATE THEM INTO WHEN YOU APPLY THE OFFLINE VOTES. Donation Minimum: The minimum donation an voter is required to make in the voting process in order to qualify for the bonus votes. Promotional Votes (Bonus Votes): The amount of bonus votes a voter receives for making the donation minimum. Start Date: The start date and time of your promotion. 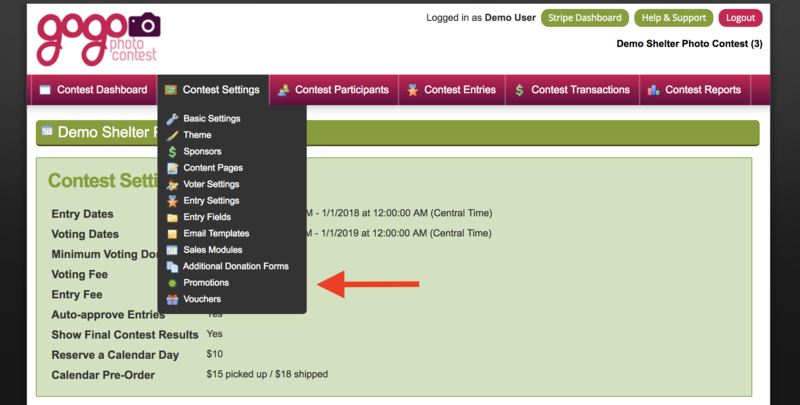 The time will always correspond with the time zone in your contest settings. End Date: The end date and time of your promotion. The time will always correspond with the time zone in your contest settings. 6. As you fill out the fields, the language in the PROMOTION LANGUAGE (GRAY BOX) will update. This is what is displayed to voters during the voting process (on an entry's voting page). If the voter donates for 25 votes ($25.00), they'll receive 50 votes (25 bonus votes). If they donate for 35 votes ($35.00), they'll receive 60 votes (25 bonus votes). If they donate for 50 votes ($50.00), they'll receive 100 votes (50 bonus votes). This module is brand new and still in beta mode. If you have any questions, run into any bugs, or have suggestions on how to improve it, please contact us.